Chess pastry cutters handmade in brass by Biggles to celebrate the first year of Ms. Sophie Sarin's "Thursday Chess Club." 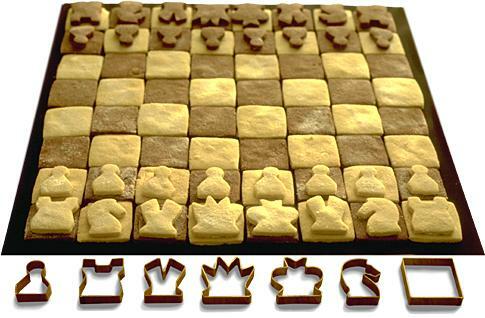 Each piece can be made into biscuits. Not only do you have the satisfaction of taking a piece, but you can eat it as well! Silvertone and black plastic; times up to 60 minutes. 2 1/4" x 2 1/4"
Turn your grill into a griddle. Or stir-fry pan. Or Cheesesteak Maker. Or Fajita Feaster. Welded cross bracing prevents twisting while the grease trough stops flare-ups. Two-inch sidewalls keep food from falling into the flames. Stainless steel. Hand wash.
"If the bread is bad, the whole of life is bad." The Grand Prix de la Baguette de la Ville de Paris in an annual competition amongst Parisian bakers and pastry chefs, created to promote the art of the baguette. More than a hundred bakers compete in the contest. Each contestant submits a traditional French baguette, which, according to contest rules, must measure exactly 70 centimeters long, weigh between 250 and 300 grams, and consist of nothing more than wheat flour, salt, water, and yeast. This year, the award went to Anis Bouabsa. His secret? 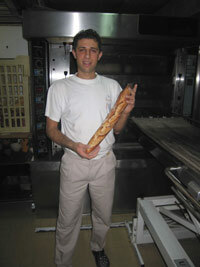 He lets the dough ferment for up to 30 hours, as opposed to the conventional three. The extra time amkes for a more flavorful and delicately textured braid, the 28-year-old baker says. His winning loaf will be served on the table of French president Nicolas Sarkozy every day for the next year (until next year's winner takes over). 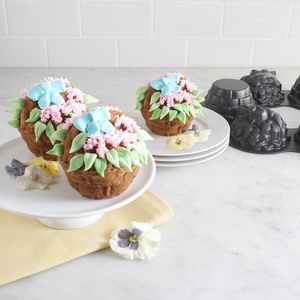 A pretty way to add spring flair to Easter baking. 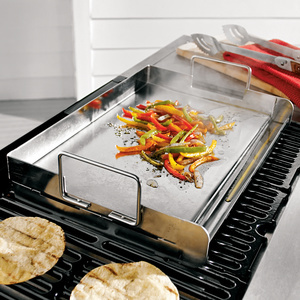 Durable cast aluminum with nonstick interior for easy release and cleanup. 6-cup capacity (makes 3 cakes, 2 cups each). Hand wash. 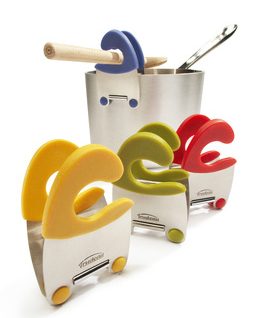 Handy space-saving gadget allows residue from the utensil to drip back into pan. 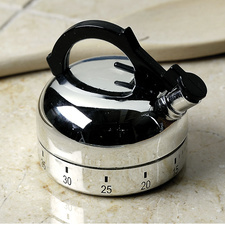 Stainless steel and silicone; heat resistant to 600°F. Dishwasher safe. 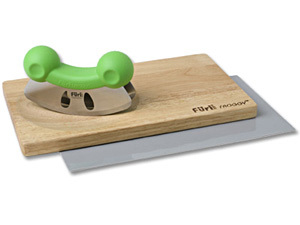 The reversible wooden chopping board is designed with a curved bowl for easy chopping- flip it over and use the flat surface for additional chopping with a knife. Plus, a non-slip mat prevents the board from sliding on counter surfaces. 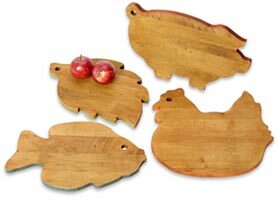 These hand-crafted maple slabs are treated with food-safe antique stain, a retro-colored edge, and are lightly distressed to add character. 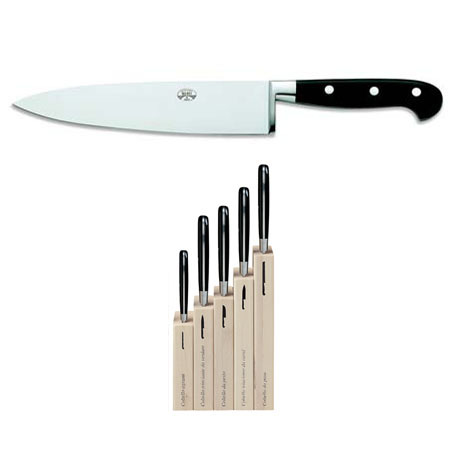 Sold individually or as a set.